The Los Angeles-based company comes out of stealth mode with a solar-power system capable of concentrating sunlight beyond what normally would be the burning point. It plans to begin producing its concentrators, named Xtreme, in about a year. Startup Sunrgi came out of stealth mode Tuesday with a claim that it can intensify sunlight by more than 1,600 times – or around twice as much as its competitors – and convert it into electricity at the same cost as electricity from fossil fuels. Like other concentrating photovoltaic technologies, Sunrgi’s technology uses lenses to concentrate sunlight and direct it onto solar cells. These systems have the advantage of using smaller cells, potentially cutting the cost of expensive materials that convert sunlight into electricity. But they also have their limitations. Concentrate too much sunlight and the heat disintegrates the cell, burning it up like an ant under a magnifying glass, said co-founder and partner Robert Block. Sunrgi, founded in 2006, thinks it has found a way to solve that problem. It has developed a technology that prevents the heat from building up. It’s a material developed with nanotechnology that Paul Sidlo, a co-founder and partner at Sunrgi, calls “goop.” The goop, which gets mounted on the back of a solar cell made by Boeing subsidiary Spectrolab, conducts heat away from the cell, he said. The goop enables concentrations of up to 2,000 times the natural sunlight -- which normally would subject the cell to more than 3,300 degrees Fahrenheit -- while keeping the cell at only 20 degrees hotter than the outside temperature, Sidlo said. The company wouldn’t give more details about the goop, but said it hopes the material will enable it to concentrate the sun at even higher levels in the future. For comparison, Pasadena, Calif.-based Soliant Energy claims its system can concentrate the sun's light by 500 times, and another Pasadena company, Energy Innovations, says it can concentrate the sun's light by 832 times, according to Steve Chadima, chief marketing officer for Energy Innovations. With such high concentrations, Sunrgi said it can cut the cost of solar electricity to 5 cents per kilowatt-hour, competitive with wholesale prices for conventional electricity. 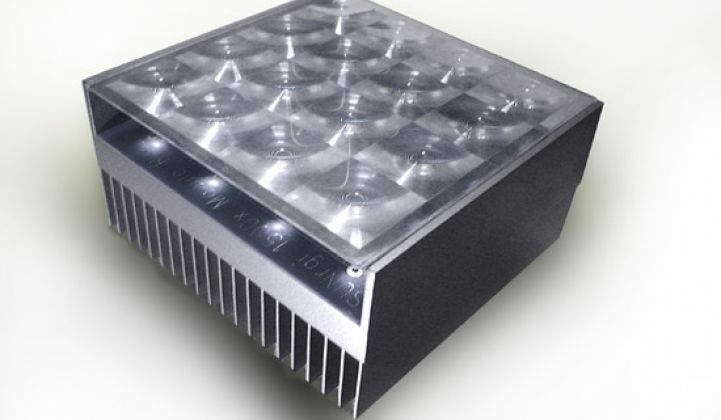 Sunrgi expects to begin production of its systems, called Xtreme Concentrated Photovoltaics, in about a year. Initially, the company plans to sell its systems to utilities, government institutions, corporations and others looking for to build large renewable-power projects. Sarah Kurtz, principal scientist for the National Renewable Energy Laboratory, said Sunrgi’s claims are realistic. "I have seen concepts that deliver up to 2,000 suns," she said. "So they are well within the realm of what can be achieved." But even if the company can deliver on its promise, it still faces some challenges. Aside from the heat issue, wind and other elements also have been a barrier to companies that have tried to make systems that concentrate sunlight more than 1,000 times, Kurtz said. With a system getting buffeted by the wind, it's harder to keep the sunlight exactly focused on the cells. "The higher you concentrate, the harder it is to hit the spot," she said. Some analysts also have been skeptical about the future of concentrating PV. 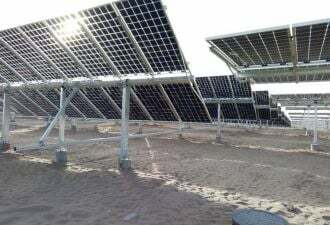 A report released a month ago by the Prometheus Institute and Greentech Media forecast that concentrating photovoltaics will make up only about 2 percent of the solar market in 2020, making it a "niche technology" (see Concentrating Solar to Reach 18 Gigawatts by 2020). Sidlo, however, doesn't agree that concentrating photovoltaics will be relegated to a niche. He said advancements in nanotechnology, such as Sunrgi’s goop, will enable concentrating photovoltaics to grow a bigger market. While it has plenty of storms to weather, if Sunrgi can make solar electricity competitive with grid prices today – and find a way to make its technology work in windy conditions – its future could be sunny indeed.